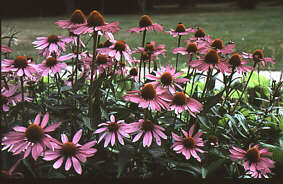 Purple coneflower (Echinacea purpurea) contains substances which stimulate the body’s immune system. Linnaeus gave the plant the scientific name Rudbeckia purpurea, to honour Olof Rudbeck – his predecessor in the post of professor of medicine. But nowadays purple coneflower bears the scientific name Echinacea purpurea. The plant originates in North America but was brought to Europe during the latter part of the 17th century. It was cultivated as early as 1699 in the botanical gardens at the University of Oxford in England. In Linnaeus’ time the purple coneflower was not known to have medicinal effects but was cultivated as an ornamental plant. A physician in Nebraska in the USA learnt from Indians in 1871 that the plant could be crushed and used on open sores. He recommended it as a means of cleansing the blood as well as against eczema, haemorrhoids, malaria, migraine, snake bites and rheumatism. Between 1885 and 1935 the plant was used against bacterial infections but that was discontinued with the discovery of sulfonamide – a synthetic antibiotic. In Germany, much work was carried out on the plant during the period 1940–1955 where it was found that it was not as effective killing bacteria as had at first been believed and during the same time penicillin was beginning to be used widely. Recent research has shown that the purple coneflower has interesting medicinal effects, as does its relative blacksamson, Echinacea angustifolia. Extracts from these plants are considered to stimulate the immune defence and are therefore recommended for treating mildly infectious diseases as well as common colds. Preparations such as these are now big sellers on the market of herbal remedies and research is still continuing on their effects. They have been shown to have local bactericidal effects and speed up the healing process of sores that are hard to treat, all of which motivates the Indians’ use of the plant. There have also been many clinical trials that have shown that extract of echinacea probably has a positive effect on the immune defence system and therefore should be useful against colds and similar problems.